Born/lived: Germany, NYC, Woodstock, NY. Known: as “the Painter of Snow”. He was a plein-air American Impressionist painter capturing the fleeting moods of nature during a period when winter scene genre was rapidly rising in popularity. 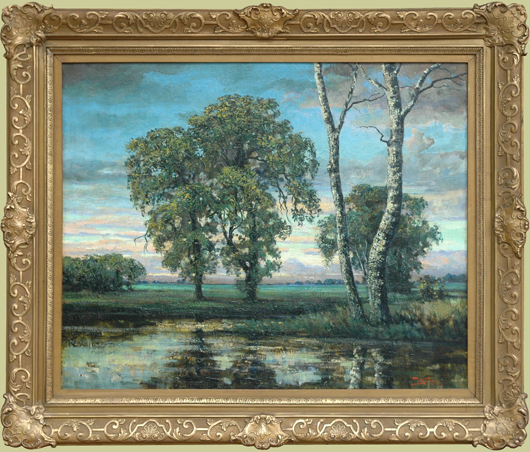 Koeniger painted scenes of the Catskill Mountains and wooded areas around Woodstock and Saugerties. He painted in broad, large strokes, rendering brilliant sunlight and glowing color harmonies, soft gradations of color in the sky, streams and forests. The artist adapted the blue and purple shadows of the impressionist aesthetic. Reportedly, Koeniger would delay the completion of a painting until the setting sun would add the proper tint of orange to the scene. Studied: studied art under Eugene Gustav Duecker and Eduard Karl Franz Gebhardt at the Düsseldorf Academy. Member: Salmagundi Club; the Woodstock art colony. Exhibited: National Academy of Design; Vose Galleries, Boston; Toledo Museum of Art. Work: Toledo Museum of Art; Arizona State University Art Museum; University of Arizona Museum of Art; Nelson-Atkins Museum of Art, Kansas City; Springville Museum of Art, Springville, UT; Delval Fine Arts Consortium, Lansdale, PA and in private collections. Publications: He wrote “Koeniger Painter of Snow” in 1925; the covers of “Literary Digest”.